A book created by a local celebrity to help vulnerable primary school children who may be suffering abuse or neglect has been launched in Bath, thanks to the financial support of local Bath businesses and councillors. 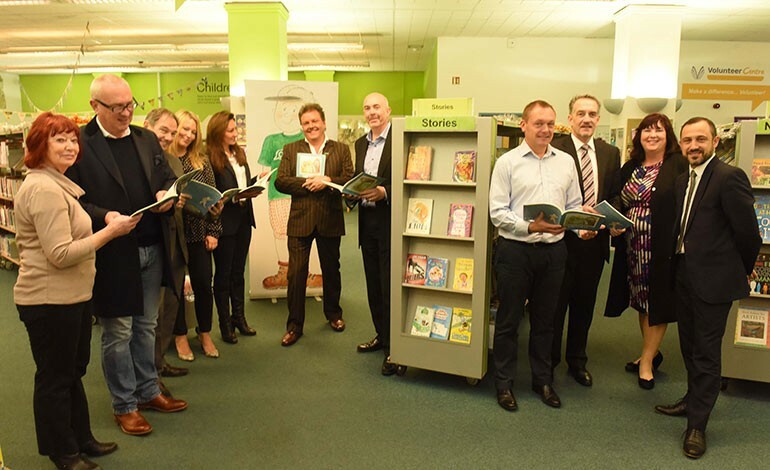 “Sadsville” has been written by local author Martin Roberts, who is best known for his role as BBC TV presenter of Homes under the Hammer, in support of the NSPCC Schools Programme. Every primary school child in year 5 and 6 (9 & 10 year olds) in Bath & North East Somerset will receive a free copy of the book, and it is hoped the “Sadsville” book will be made available to other schools in the South West region as well as nationally. Martin, who is a father of two and lives in North East Somerset, is a long standing champion of the NSPCC and has created a series of children’s books called “The Villes”. In each book the children read about something going wrong in that Ville and the story gradually unravels. The hero of the stories, Herman, solves the problem. The books encourage problem solving and Sadsville ends by telling the children how to get help if they have a problem for any reason, and also directs them to the NSPCC’s support service Childline. Martin Roberts explained: “The idea behind the book series is that by the end of each book the children will hopefully learn how to find a way of solving issues that concern them in their own world. The NSPCC schools programme is something I feel passionate about. “Unfortunately, many children suffer neglect and abuse and it is crucial we continue to identify new ways to reach out to children so that they feel supported particularly in their early years. “Since our launch evening in November, I have been overwhelmed with the support given to this project. It has been a truly humbling experience. Phil Lodge, of Specsavers Bath said: “It is upsetting to think that some children may feel worried and not have anyone to talk to or be able to speak to their parents. The Bath businesses that have generously provided sponsorship and made this project possible are Specsavers, Curo Housing, Rise and Mogers Drewett. Councillors Martin Veal, Liz Hardman, Donal Hassett and Ian Gilchrist have also funded and supported the project. The book was kindly illustrated by artist Jackie Geoghegan, designed by Natasha Hutton of Frome company Postscript and the original copies printed in kind by Opal Print in Midsomer Norton. The project is being coordinated by Loraine Morgan-Brinkhurst MBE and there are still sponsorship opportunities for businesses and individuals to sponsor the 4000 Bath & North East Somerset books before it goes to print in January 2016, there are many benefits for sponsors which also includes sponsoring companies information in the B&NES Sadsville book. For more information contact loraine@morganbrinkhurstconsultancy.co.uk or 01225 823004.